Presidential candidate for the Progressive Party of Maldives (PPM) has pledged to find a way for women civil servants to work from home, in a PPM government. Speaking at a special event held for women in SHE Building on Monday night, Yameen said that he will push for women civil servants to work from home and in time, encourage working from home in the private sector. “We will start in our government, so our civil service employees can work from home. They will work with full pay, and depending on the civil servant experience, we will legislate for all Maldivian industries to do this,” Yameen said. He said that a PPM government will work for the rights and empowerment of women and said that economic empowerment is vital for women to fully realize their rights. Independence is the key to economic empowerment, Yameen said. “Women will gain their rights by political and economic empowerment. 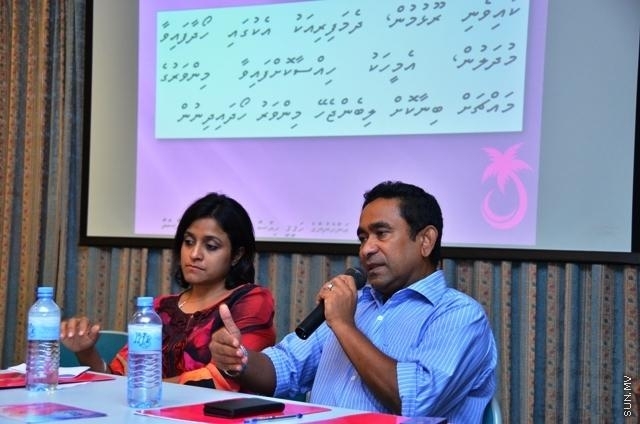 We will work to empower women,” Yameen said. Yameen encouraged more women to step forward into the political arena and said that a PPM government will try to achieve a certain percentage for women’s participation in politics.